UNITED NATIONS, June 4, updated June 5 and 12 -- The UN, which preaches transparency and openness to civil society, has this week given conference room space in its headquarters to a series of closed-door meetings of corporations ranging from Citigroup to Sovereign Bank, the New York Times to Major League Baseball. Vice President of Diversity and Inclusion, David Lipscomb, will present at the World Diversity Leadership Summit (WDLS) today and Tuesday, June 5, 2007 at the United Nations' General Assembly building in New York. Today Lipscomb will participate in a panel discussion titled "What's Next - Leveraging Diversity and Inclusion for ROI and Profit Generation" at 2:30 p.m.... Hosted by the United Nations Global Compact, the WDLS brings together leading policy experts, government officials, corporate executives and NGO representatives to discuss the ramifications of diversity on the globalization process. At 2:30 on Monday, Inner City Press went to the basement of UN Headquarters to where the publicly-announced panel discussion was to take place, Conference Room C. A sign facing the hallway said "sponsored by the Executive Office of the Secretary-General, Hilton Hotels Corporation presents WDLS 2007, hosted by the UN Global Compact." 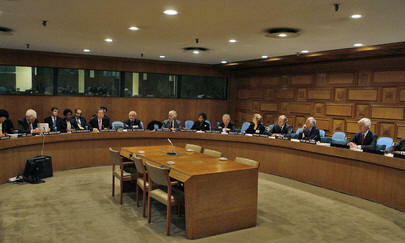 Hilton Hotels Corporation also put out a press release touting its involvement at UN Headquarters, click here to view. For this diversity conference, the UN Global Compact has in a press release hyped the participation of Major League Baseball commissioner Bud Selig, and of MGM Mirage. It's a lot of pitching to the press for an event which, even though held in the United Nations, is closed, including to the press. The transparency... is a mirage. What secrets of corporate "best practices" could have been discussed inside? The UN Global Compact, which complains about a lack of coverage from the UN press corps, has in the past five days held two closed meetings in UN headquarters: with Coca-Cola in the Delegates Dining Room on May 31, and now in the UN basement conference rooms on June 4. In between, it played a role in a more public event on the North Lawn on June 1, there partnering with Dow Chemicals. Two protesters with a banner were removed, and the press was told to go cover the event, for Blue Planet Run, and not to cover the protest. Click here for that story. Three days later, rather than increased openness, there is less. Inner City Press: Down in the basement, yesterday and today, there's this conference called the World Diversity Leadership Summit, and it's being sponsored by the United Nations, by the Executive Office of the Secretary-General (EOSG). I tried to attend yesterday but they said it's a closed meeting. It actually costs $1,000 to attend this conference. I'm wondering what the UN�s policy is on giving its facilities for a for-profit conference, costing $1,000? Deputy Spokesperson: I am not aware of this conference, so I'd have to look into that for you. Question: If you could, that would be good. Because it says EOSG right at the top, hosted by the EOSG, and then "entry fee $1,000." Deputy Spokesperson: Thanks for the tip off. I'll look into it for you. While even Tuesday afternoon several sessions remain closed, at an opened-up session in Conference Room 4, a speaker opined that George W. Bush is the ultimate beneficiary of affirmative action, through among other things legacy college admission, while a representative of Luftansa claimed to go beyond mere legal diversity requirements. We'll continue on this beat. Update of June 12 -- The Global Compact has pointed out that while it was the topic of the May 31 luncheon with Coca-Cola, it was not technically a sponsor, and the June 1 event with Dow Chemical was by the UN Fund for International Partnerships. Inner City Press on June 7 asked the Global Compact for a statement on where the $1000 fees from the Global Compact co-sponsored World Diversity Leadership Summit went. When the promised answer is received, we will report it here.